The weather continues to be hot so I was in the mood for a salad. I combined a few different favorites and came up with what I called "gyros salad." I used a package of the morningstar farms "steak strips" and marinaded them in some red wine vinegar and greek seasoning. I let them sit for a few hours and then stir fried them in a bit of olive oil until they were sort of crispy and browned. I also made a batch of the onions from this recipe. I tossed the warm strips and onions with thinly sliced romaine and red leaf lettuce, kalamata olives, cherry tomatoes, tofu feta (I used the recipe in the current issue of VegNews - very good in a salad) and sliced Persian cucumber. 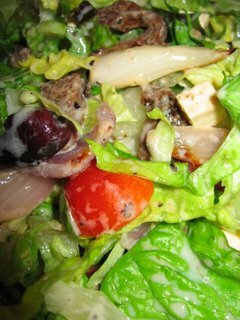 For the dressing I did my usual Greek salad dressing - plain soy yogurt, red wine vinegar, granulated garlic, salt, pepper and some oregano. The combination of the warm onions and veggie strips with the cool lettuce was so good. Lots of flavors and textures and they all worked well together. I'd also picked up the "middle east feast" from Trader Joe's - it has some falafel, hummus, pita bread and tabbouleh. I can't believe they are opening a new TJ's in Walnut Creek. I already have 4 Trader Joe's within 15 minutes of my house - this will make 5. I always feel bad when people say they drive an hour to get to one! I went to the produce store today and they had cherries - not organic - but I washed them with pesticide removing wash. I don't know how well it works but I like to believe it helps. 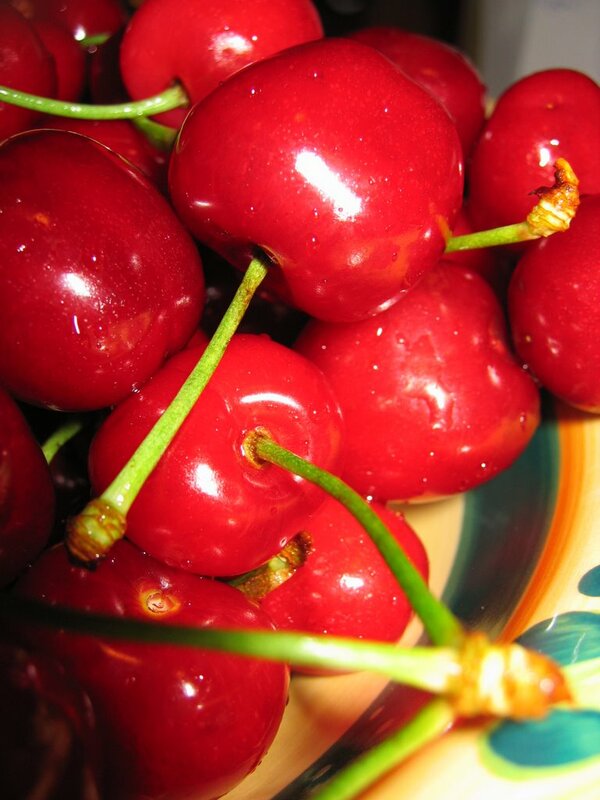 I also ended up at Whole Foods - they also had cherries, conventional as well, and they were selling them for $14.99 a pound!!! I was convinced it had to be a typo but they had two varieties and they each had a sign for $14.99 a pound. That's insane! Whole Foods... argh! They are out of my price range mostly. Thank goodness for Trader Joe's (they're not as plentiful down here as they seem to be by you, but I do have one close by!) and we also have a place called Henry's (and another called Boney's, which started Henry's before they went corporate--->) that are under the Wild Oats "flagship" which offer good veggies and fruit at decent prices. $14.99!!!??? I am in disbelief. That is just WRONG. SALAD rules on nice Spring days... Hope you have a great weekend, too.